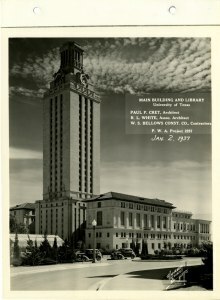 The Architecture & Planning Library and the Alexander Architectural Archives are pleased to recognize the 80th anniversary of the University of Texas Tower’s dedication by featuring the iconic structure in its fifth installment of the To Better Know a Building exhibition series. The Alexander Architectural Archive is fortunate to have an abundance of documentation for the building including construction drawings, shop drawings, construction photographs and project files from the University of Texas Buildings collection. Correspondence between the architects and the University can be found in the Faculty Building Committee records kept by Robert Leon White, supervising architect. The exhibit series seeks to explore buildings through drawings and other visual items found in the Alexander Architectural Archive and Architecture & Planning Library with a focus on working drawings. Plans, elevations, sections and details communicate the realization of design intent and can be used as a vehicle in teaching through example. The exhibit opens on February 27, 2017, with a reception, and the exhibit extends through August 7, 2017. Free and open to the public.